Do You Worry Too Much? Yep! I once read about a study in which people were asked to write down their worries over an extended period of time and then identify which ones actually happened. 85% of what was considered enough of a worry to be worth writing down at the time never happened! And what of the 15% that did? Well – 79% of respondents (that’s almost four out of five) said that the things that DID happen actually helped them learn a valuable lesson – or at the very least, they were easier to handle than expected. Are you following the math? This means that 97% percent of what you worry about is not worth worrying about. 97%! Either it’s not going to happen at all – or if it does, it’ll either be easier to handle than you think, or you’ll look back on it and be thankful for the lesson you learned. This is worth taking seriously, not just from an emotional and mental perspective (think of how much more you’d enjoy life if you were able to cut your current level of worry by 97%) – but from a physical stand point it’s been proven many times that stress can cause serious health problems. The sort of hormones that are released when we choose (yes – it is a choice) to focus on the worst-case scenario, or the negative ‘what ifs’ have been linked to shrinking brain mass and a lowering of your IQ. In other words, worrying literally makes us dumber! It’s also been shown to increase the chance of heart disease, cancer, dementia, Alzheimer’s and premature aging – doesn’t that all sound lovely? 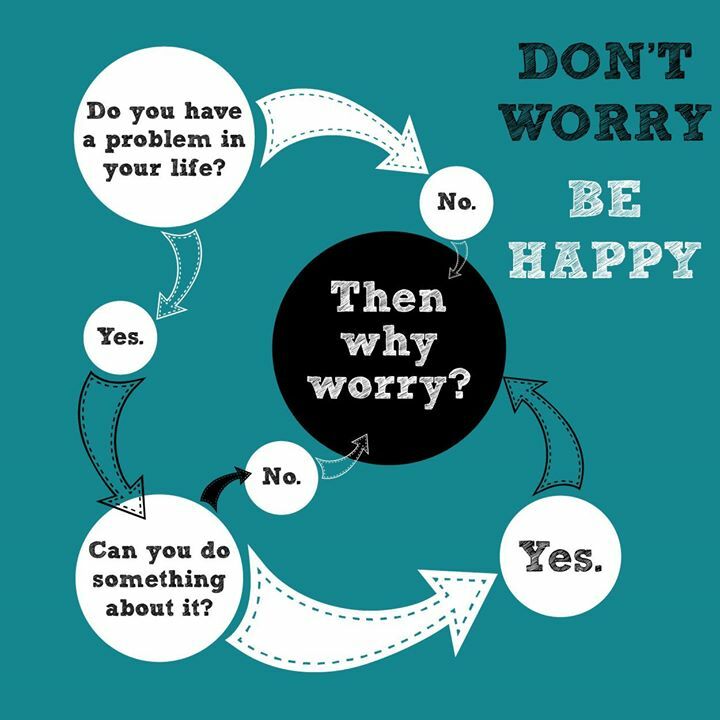 If the answer is “No” – then why worry? You can’t do anything about it – worrying isn’t going to change a thing. If the answer is “Yes” then why worry? Just start doing what you need to do to change it. Either way – worry serves absolutely NO purpose. So the next time someone says: “Don’t worry about it.” – do yourself a favour and take their advice!